Watercolor portrait of Ada King, Countess of Lovelace. Alfred Edward Chalon, 1840. Augusta Ada King, Countess of Lovelace was born Augusta Ada Byron on 10 December 1815, the only child of the poet Lord Byron and his wife Anne Isabella Byron. Augusta was named after Byron’s half-sister, Augusta Leigh, and was called ‘Ada’ by Byron himself. Ada was brought up by her mother, who educated her as a mathematician and a scientist in order to avoid the ‘poetic’ influences of her father’s nature. Ada was a bright and curious child, and from her early years experimented with mechanical things. She described her approach as ‘poetical science’ and herself as an ‘Analyst (& Metaphysician)’. As a young adult, her mathematical talents led her to an ongoing working relationship and friendship with British mathematician Charles Babbage and his social circle. In particular Ada was enthralled by Babbage’s plans for the Analytical Engine, now recognised as the first general-purpose computer, though such machines were only constructed one hundred years later. Between 1842 and 1843, she translated an article by Italian military engineer Luigi Menabrea on the engine, which she supplemented with an elaborate set of notes of her own, simply called Notes. 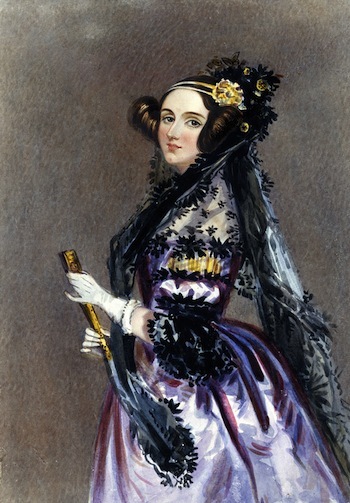 ‘Supposing, for instance, that the fundamental relations of pitched sounds in the science of harmony and of musical composition were susceptible of such expression and adaptations, the engine might compose elaborate and scientific pieces of music of any degree of complexity or extent’ (Ada Lovelace 1843). ‘The Analytical Engine has no pretensions whatever to originate anything. It can do whatever we know how to order it to perform. It can follow analysis, but it has no power of anticipating any analytical revelations or truths. Its province is to assist us in making available what we are already acquainted with’ (Ada Lovelace 1843). Lovelace had wide scientific interests: her remarkable correspondence course in mathematics with De Morgan explores controversies of the day, such as the nature of algebra, and she speculated in a far-thinking way on the potential of mathematics and computing: for a “calculus of the nervous system”, or to investigate music. On 8 July 1835 she married William King, 8th Baron King. The couple had three children: Byron (born 12 May 1836); Anne Isabella (called Annabella, later Lady Anne Blunt; born 22 September 1837), and Ralph Gordon (born 2 July 1839). In 1838, her husband became Earl of Lovelace. She was thus styled ‘The Right Honourable the Countess of Lovelace’ for most of her married life. Ada’s health was always fragile, but it declined dramatically after 1843. She died at the age of 36 – the same age that her father had died – on 27 November 1852, from uterine cancer. She was buried, at her request, next to her father at the Church of St. Mary Magdalene near Lord Byron’s ancestral home at Newstead Abbey. In 1993 a blue plaque was erected at her home at 12 (formerly 10) St James’s Square, London, in commemoration of her being a ‘pioneer of the computer’.